Training calf roping horses requires considerable time and knowledge on the part of the trainer. 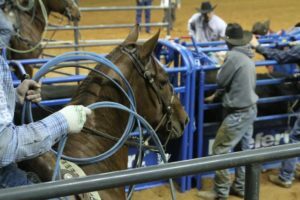 Top tie-down roping horses require considerable patient training to become consistent for a cowboy to make a winning run. C.R. Bradley, trainer at Collinsville, Texas, spends hours and hours with lots of patience to get his horses where he wants them. When starting a rope horse, Bradley puts a calf in the arena and gets it to pay attention to the calf. As the horse becomes comfortable with the correct position, Bradley will rope the calf with a breakaway or knot rope. “I allow the horse to stop as I pull my slack,” he said. The next step is letting a calf out of the chute before tracking it around the arena. Bradley lets his horse slowly leave the box and gradually catch up to the calf. If the horse is coming out of its stop, not wanting to take the jerk from the calf, Bradley will take slack out of the reins. When the horse yields to the pressure and comes back, he releases it. “After doing this a couple of times, I’ll give the horse a chance to stop and get back on its own,” Bradley said. Horses should work the rope because they know what to do, not because they’re scared. Start with ropes attached to the horn on each side of the horse’s neck through keepers on the tie-down. “Standing in front of the horse, I ask the horse to back up a few steps on his own,” Bradley said. When the horse is comfortable backing, Bradley attaches one of the ropes to a log. “Always wait until the rope is tight between the horse and the log before getting off of your horse,” Bradley said. “Teach your horse to pull the weight until you sit down on the log, as if the log is a calf. Your horse should stop when you sit,” Bradley explained. When the horse understands when to stop pulling, he needs to hold the rope tight between himself and the log. “When the horse is doing everything correctly, use just one rope,” Bradley said. The first few times Bradley wants a calf tied down, he’ll stay on the horse while another person flanks and ties the calf. “I prefer to get off the left side of the horse for a while to keeps them stopping straight,” Bradley said. In the roping box, the horse must be relaxed and pay attention. Riding with short reins, Bradley keeps his hand low and moves slowly and relaxed. The horse is slowly backed into the corner and must stand straight with equal weight on all four legs. “I always have steady contact with the horse’s mouth,” Bradley said. “If I release the pressure, the horse should move forward. If a problem arises, I try to take the horse away from the box and make him work. “Then I come back to the problem, make the horse do it right and then rest. It’s important to fix problems in the box as soon as they happen,” Bradley said. He wants his horse to give 100 percent every time. 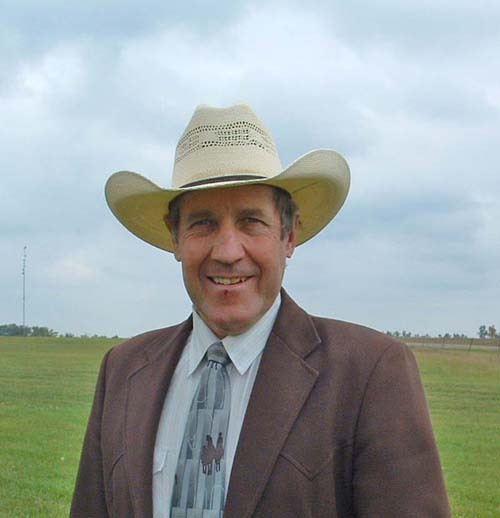 “If my horse is trying, I’ll only run two to four calves, once or twice a week,” Bradley said. “If problems arise, I have more success working on parts of the run separately,” Bradley said. “I get the first maneuver down correctly before working on the next step. “I always give my horses a chance to work on their own, but if they do make a mistake, I’ll correct them immediately,” Bradley said.